Check-Secure is a security device that is designed to store printer resources such as electronic forms, fonts, signatures, and logos on a removable Compact Flash Card (CFC). The compact flash card and the resources it contains can be stored in a secure location such as a safe or locked drawer when not in use offering protection against the unwanted printing of checks, drafts, and other such documents. During normal operation, Check-Secure requires very little attention. When the compact flash card is not inserted into the Check-Secure device, the unit is transparent and automatically passes all print jobs to the printer. The printer operates the same as it did before Check-Secure was installed. When the compact flash card is inserted into the Check-Secure device, it first verifies that the card is properly formatted and the resources are properly stored on the card. Next, the device monitors the information being sent to the printer and loads all the resources stored on the card into the printer. Once loading is complete, Check-Secure automatically passes all print jobs to the printer. When the CF card is removed after printing is complete, Check-Secure resets itself and erases all resources previously loaded from the printer. Check-Secure is offered in two versions supporting parallel port and Ethernet (RJ-45) connections. An important part of Check-Secure is the removable compact flash card (CFC). This card stores in non-volatile flash memory the print resources, such as electronic forms, fonts, signatures, and logos required to print the secure documents, which offers long-lasting storage. 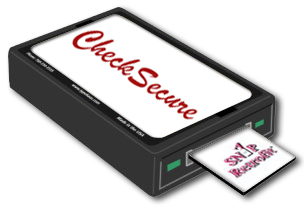 When using Check-Secure during normal printing operations, the device loads the resources stored on the card into the printer. Once the resources are loaded, documents can be printed in the normal manner.